Bone mineral density is used to diagnose osteoporosis. Normal bone mineral density is considered less than or equal to 1 standard deviation below the mean bone mineral density of 30 year old men and women. Osteopenia is diagnosed when between 1 to 2.5 standard deviations below the mean and osteoporosis is diagnosed when greater than or equal to 2.5 standard deviations below the mean. Bones are much more than calcium, it is living tissue. It’s important to know a little about bones to understand osteoporosis. Osteoblasts are like bone stem cells that are responsible for bone formation. They produce a matrix of osteoid, which is the unmineralised, organic part of bone, made mostly of collagen, and produce osteocalcin, which is a mineral binding protein to help mineralise osteoids. 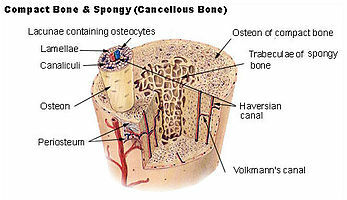 When osteoids are mineralised they become osteocytes, the most common cell in bone. I’ll refer to this process as bone formation. Osteoclasts break down bone tissue and release the bound minerals in a process called bone resorption. Bones have a natural turnover rate – osteoclasts break down damaged bone cells and osteoblasts form fresh bone cells. Osteoclasts are important as this process is necessary to adapt to exercise, recover from damage, remove old cells and maintain calcium homeostasis . Like adipocytes (fat cells) and myocytes (muscle cells), osteocytes also regulate their growth by using a negative feedback system. 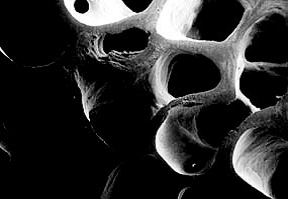 Osteocytes produce a protein called sclerostin, which inhibits further bone formation. One function of bone turnover is to maintain calcium homeostasis. Calcium is necessary for neurotransmitter release, muscle contraction, etc. Serum calcium levels is tightly regulated by two main hormones: parathyroid hormone and calcitonin. Parathyroid hormone is released in response to low serum calcium to increase it by stimulating osteoclasts to break down bone and release calcium, activating vitamin D (to 1,25-hydroxyvitamin D) to increase calcium absorption in the intestine and increase reabsorption in the kidneys. Calcitonin is released in response to high serum calcium to decrease it by decreasing osteoblast activity, calcium absorption and reabsorption (essentially the opposite of parathyroid hormone). This may lead one to think that osteoclasts and parathyroid hormone are ‘bad’ while osteoblasts and calcitonin are ‘good’. Remember that both bone remodelling and calcium homeostasis is important – all four are ‘good’ in the right amount. Osteoporosis is likely due to too little osteoblast activity (bone formation) and/or too much osteoclast activity (bone resorption). 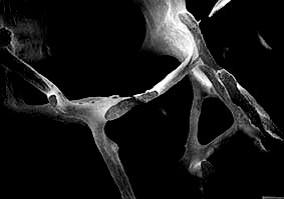 Hyperparathyroidism, which may be caused by cancer, vitamin D deficiency and kidney failure, can lead to osteoporosis. But intermittent pulses of parathyroid hormone (the normal physiological condition) actually improve bone mineral density and bone quality by increasing IGF-1, preventing osteoblast apoptosis and inhibiting sclerostin .